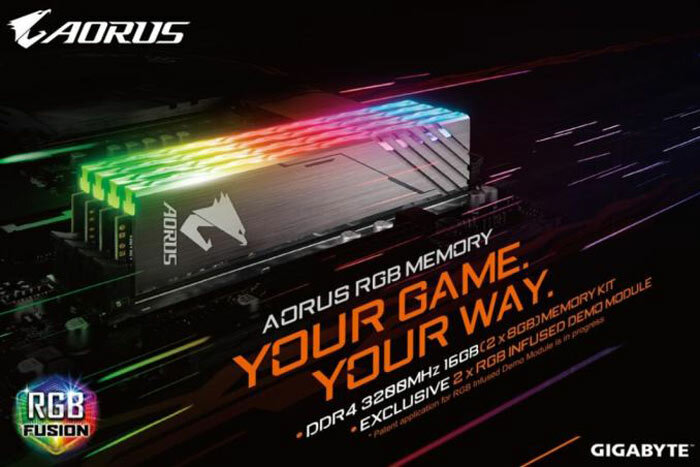 Gigabyte has entered the PC RAM market with its Aorus branded RGB memory kits. There seems to be just one RGB Fusion compatible memory kit at launch time which will furnish your PC system with 16GB of RAM. Interestingly the 2x 8GB kit includes two further RGB Infused Demo Modules, to max out your motherboard RGB RAM lighting potential. The new PC RAM product is yet to be listed on the Gigabyte or Aorus websites at the time of writing. The product has been highlighted on the official Aorus Twitter account though, in both photos and videos, as well as on Instagram. As listed above, the RAM is provided in a dual-channel kit with top speed of 3200MHz, C16 latency, and runs at 1.35v. The heatspreader colour is exclusively silver for now. Usually RGB RAM can do some tricks on its own, and these modules are also compatible with Gigabyte's RGB Fusion Link for cross system/peripheral sync lighting and effects. 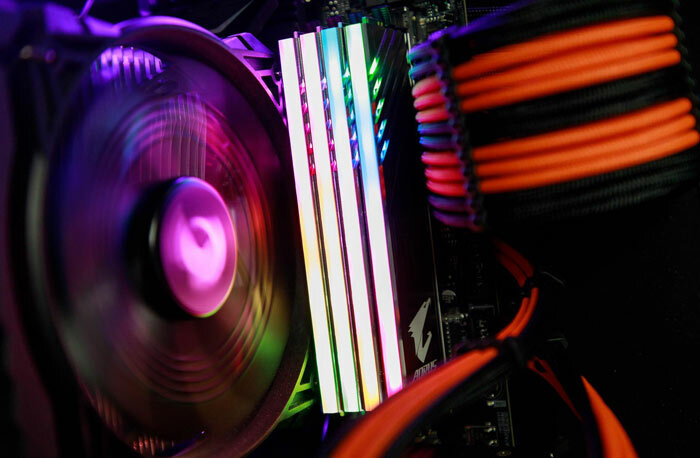 We don't know how many LEDs make up the light bar component on top of the RAM but I would say that it looks like it is indeed multi-zone programmable, like Corsair's recent Vengeance RGB Pro product. 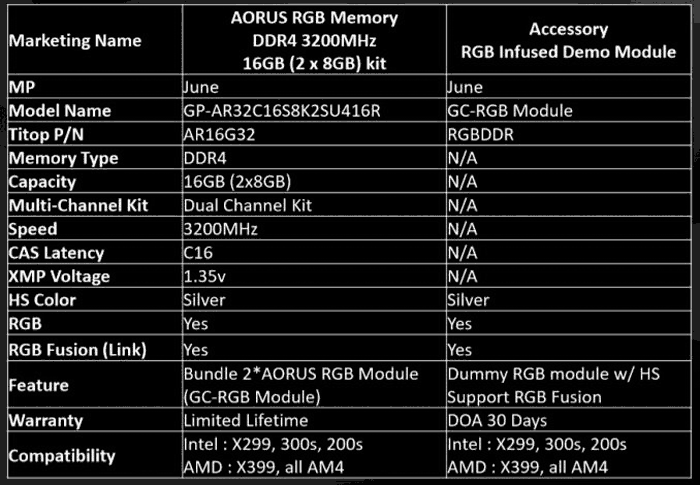 Gigabyte will be selling its Aorus RGB DDR4 16GB memory kit (2x 8GB), including 2x dummy RGB sticks, for US$229 by the end of June, says the source. Buyers receive a limited lifetime on the memory but the free dummy RGB modules carry a paltry 30 days DOA guarantee. Would dummy sticks really appeal to anyone? They just seem pointless to me. I once had a motorcycle which had a dummy exhaust. It was utterly stupid. The bike itself was awful and sluggish (to the point where I, a very conservative rider, blew up the engine trying to make it go) and this just added weight for zero functional improvement. It's the same here. It's marketing for people who care more about appearance than performance. Some people build machines for the look and, if you don't get that with PCs, just look at an old steam engine or old tools that are beautifully crafted and you get the picture. I bought me a solid forged steel axe with a leather handle just because it was so amazingly crafted. I can see why some people would want their RAM slots all full of flashy stuff and whilst it's not for me, they've gone and made RAM so damned expensive that now they can actually make money off dummy RAM. Insane. Some like their headphones not to sound like tin cans, and some like it look like Christmas tree. To each his own, I can defo see the use scenario if you already are the kind of person who wants RGB lights on ram. 30 day warranty on the dummy sticks?